VinAssure™ is a hand-held, lightweight, high pressure cylinder with custom engineered pressure regulator and delivery trigger that uses 100% Air Liquide Aligal™ Argon Gas, the same high-quality gas used in wine making. Each filled cylinder preserves up to 700 bottles translating to low per use cost (less than $0.04 per use). It is the only hand-held device on the United States market using a pressurized cylinder and high quality argon gas. Left over wine that is not stored properly after opening begins to oxidize and degrade quickly. The more sensitive your palate, the more you will notice the loss of attractive aroma and flavor components of a wine. The best method of sealing in the aroma and flavor is with a layer of argon gas which displaces air and forms a protective blanket over the wine. Practically every high-priced commercial wine preservation system uses argon because it is inert and is the heaviest of the colorless, odorless gases that will preserve wine. The inexpensive systems available on the market provide a very small number of uses and per use cost is as much as $0.25 each time you use them. These systems keep the gas at a low pressure or use very small gas cartridges which don’t hold much gas. VinAssure™ grew out of a simple system that the developers used daily for over three years in their wine shop and tasting bar. It was so simple and economical they decided to develop a system for both home and commercial use. The system is easy to use with no parts to clean or maintain and replacement cylinders are available. 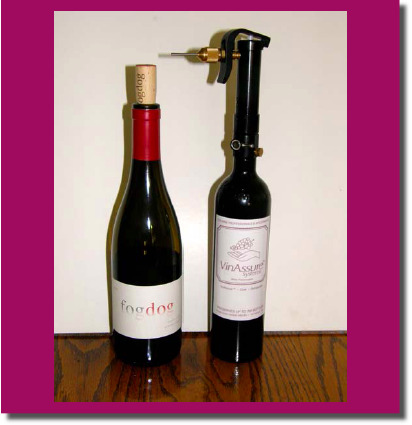 Simply open the valve, inject argon gas into the bottle until the wine’s aroma is noticeable (about 3 seconds), replace the original cork and return the wine to your cellar or refrigerator. I used the VinAssure™ system at home and found it perfectly preserved bottles of Pinot Noir and Chardonnay for three days after the bottle was initially opened. Since my wife and I rarely polish off a whole bottle at dinner, the system has been invaluable to us. Visit the website, www.vinassure.com for more information and to view a video of the use of this system. Retail cost is $249 plus $22.50 hazardous material charge plus regular ground shipping charges. (per use cost still about $0.10). Replacement cylinders are sold for $39 (exchange) or $69 (filled cylinder). Discounts are offered to wineries, wine bar owners, restaurateurs and other members of the trade. Disclaimer: I have no financial interest in this product and receive no percentage of sales. I just think it is a great product!